Chris is delighted to announce he will be starring in The Illusionists at the Shaftesbury Theatre in London’s West End. This will be his third West End season. Tickets are on sale now and can be purchased here. 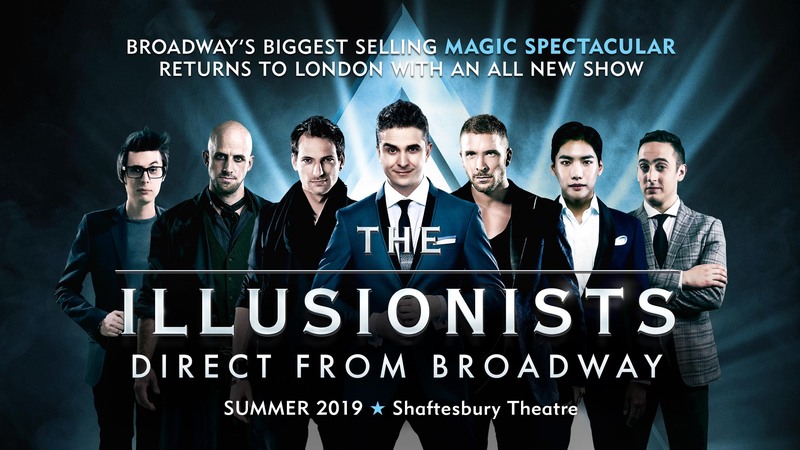 THE ILLUSIONISTS– DIRECT FROM BROADWAY WILL PLAY A STRICTLY LIMITED SEASON AT THE SHAFTESBURY THEATRE FROM 6THJULY TO 1ST SEPTEMBER 2019. The world’s biggest selling magic spectacular, The Illusionists – Direct From Broadway, will return to London’s West End this summer with a brand new show from Saturday 6th July to Sunday 1st September at the Shaftesbury Theatre. The all-star line-up will see audiences wowed by The Showman James More, The Unforgettable Enzo, The Manipulator Yu Ho-Jin, The Futurist Adam Trent, The Mentalist Chris Cox, The Trickster Paul Dabek and The Daredevil Jonathan Goodwin. Last seen in the West End in 2015 and having just recently broken its fourth box office record on Broadway, The Illusionistsis a mind-blowing spectacular showcasing the jaw dropping talents of seven of the most incredible illusionists on earth. Collectively these performers have been seen by millions across the world and this production showcases their collective talents on stage together for the very first time. The Illusionistshas shattered box office records and dazzled audiences of all ages around the world with a powerful mix of the most outrageous and astonishing acts ever to be seen on stage. This spectacular show is packed with thrilling and sophisticated magic of unprecedented proportions. Prepare to witness stunning acts of grand illusion, levitation, mindreading, and disappearance next summer! The Showman, James More, is currently one of the world’s leading and most viral illusionists. He first made an impact after an incredible run on Britain’s Got Talentin 2013 and has the most watched audition from his series with over 80 million hits on YouTube. The British-born illusionist continued to make waves after a sell-out tour in Russia with his Theatre of Illusionshow and soon after was approached by The Illusionists. After performing with the show for over two years in five continents around the globe, More became the first British magician in history to appear on New York’s infamous Broadway. His fast-growing reputation also includes a special guest appearance on NBC’s, America’s got Talent,a feature on, Got Talent World Stageand numerous other television appearances. His live work comprises of performances at London’s 02 Arena, The Hollywood Pantages in Los Angeles and the Sydney Opera House to name but a few. The Unforgettable, Enzo, warns his audience to forget everything they know and prepare to live an unprecedented experience though which all their senses will be put to the test. Enzo held his first magic show at 11 years old, with humble resources. However, he wished to stage far more impressive illusions, and spent a year as an engineering student during which he was taught how to draw up plans and to understand mechanics and electrotechnics. It was his performance on France’s Got Talent, where he reached a new audience. A few years later, the audience of Le Plus Grand Cabaret du Mondewas, in turn, mesmerized. This new publicity opened him the doors to the most prestigious events in Europe, as well as some of the biggest international festivals. Enzo has since been considered a rising star of magic. In 2013, he returned to France’s Got Talent, where he wowed the jury and the audience again by making a helicopter appear on stage, an act that had never been seen before on television. In 2015 at just 26 years old, he premiered his show, Beyond Illusionsat the famous Casino de Paris. The Manipulator, Yu Ho-Jin began his career in magic aged just 9 years old and it was only a decade later that he turned the magic community upside-down and won the first prize in Stage Magic and Grand Prix at FISM World Championship of Magic 2012. Today Yu Ho-Jin is considered to be the most elegant and artistic manipulator alive by the world’s leading magicians. It is no surprise that Ho-Jin is often referred to as “the future of magic”. When Yu Ho-Jin’s nimble fingers rend the empty air as if playing the piano, astonishing notes of mystery flutter in the atmosphere and captivate the hearts of his audience. There is no deception or trickery in his work. Not only that, there is no doubt that Yu Ho-Jin has the ability of turning anyone into his fan – from children to the world’s finest magicians. The Futurist, Adam Trentinaugurated the first two record-breaking Broadway runs on the US tour of The Illusionists. His frequent TV appearances on The Ellen DeGeneres Show, The Today Show, and countless others as well as an NBC primetime TV special and his own 10-episode TV series premiering May 2017 on Red Bull TV, further highlight his appeal to audiences of all ages. The Mentalist, Chris Cox is the star of CBBC’s Chris Cox’s Mind Blowing Magic and BBC Three’s Killer Magic. he is the multi-award-winning mind reader who can’t read minds. Dubbed by The Guardian as “one of the most exciting entertainers in Britain”, Chris’ side-splitting, confident, silly, charismatic and mischievous sense of magic and wonder has been seen by over 500,000 people worldwide. He has performed two seasons in London’s West End and amazed audiences in venues such as Sydney Opera House, and The Grand West Arena Cape Town. Chris has recently been seen on television screens with One Direction reading their minds at the BBC Music Awards. He’s also appeared with Heston Blumenthal in Heston’s Recipe For Romance, Now You See It, How Magic Changed TV and The Mentalist Revealed. Chris is the Magic & Illusions Assistant for Harry Potter And The Cursed Child Parts One And Two in London. The Trickster, Paul Dabekis one of the UK’s top entertainers, he has performed across 6 continents and headlined his own show in Las Vegas. As well as appearing on BBC TV. An accomplished magician, comedian and actor, Paul’s skills have won him critical acclaim, Time Out magazine named him ‘a superb showman!’ Both the Magic Circle and the International Brotherhood of Magicians have recognized Paul’s talent naming him Young Magician of the Year and awarding him the British Shield. Fast-paced, dynamic magic, quick-witted humor, and a theatrical flair combined with a personality that reaches to the very back of the theatre. Join Paul as he reveals exactly what’s up his sleeve and delves into his box of tricks while cheekily enchanting the audience with jaw-dropping hilarity. The Daredevil and Escape Artist,British-born Jonathan Goodwinis widely considered one of the most creative, skilled and frankly crazy stunt performers in the world. Goodwin has been hanged, buried alive, hung by his toes from helicopters, burned at the stake, attacked by sharks and even sewn up inside a dead cow. Jonathan has starred in numerous TV series including One Way Out for Discovery Channel and Dangerman: The Incredible Mr Goodwin for the BBC as well as Deathwish Live, How Not To Become Sharkbait and The Seven Stupidest Things to Escape From. Featuring six of the world’s most mind-blowing magical acts, IMPOSSIBLE is the breath-taking spectacular thrilling audiences worldwide. 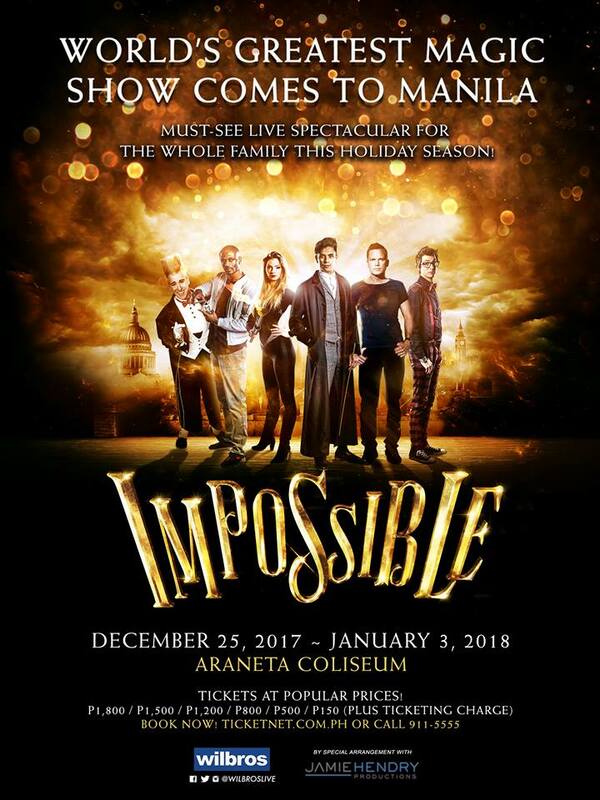 Fresh from its record-breaking second summer in London’s West End, IMPOSSIBLE continues to tour the world with headline act Chris Cox and finally comes to Manila for the holiday season this December 25 to January 3. Magical Bones: South London street conjurer and break-dancing master Magical Bones is considered the world’s best hip-hop magician. Starting out in the music industry as a dancer for the likes of Madonna and the Black Eyed Peas, Bones has since turned his attention to wowing the public with expert sleight-of-hand, and there’s no doubt the tricks up his sleeve will stump any seasoned skeptic. Chris Cox: Clear your mind before award-winning mind reading specialist Chris Cox gets his hands on it! Chris stars in BBC3’s Killer Magic, bewildering audiences with his unique mind reading talent. He’s the man behind the magic at Heston Blumenthal’s Fat Duck restaurant; he has flummoxed audiences including One Direction’s Liam Payne and Jonathan Ross on stages across the country and continues to control minds in his multi-award winning tour Fatal Distraction. Ben Hart: Ben invents unique magic which pushes the boundaries of film, theatre and television and tests the limits of illusion, including decapitation, vanishing and levitation. At the age of 16, he won the Magic Circle’s ‘Young Magician of the Year’ Award and his most recent show Belief? sold out to astonished audiences. He starred in BBC 3’s Killer Magic, where his unique and unorthodox approaches amazed audiences across the country and has recently been seen wowing BBC’s The Voice coaches. Josephine Lee: Josephine Lee is the world’s leading female illusionist. Josephine has thrilled and enchanted audiences with death defying escapes and grand illusions having recently appeared on The Next Great Magician and Britain’s Got Talent for ITV. She is also the fastest in the business, breaking the world record for the most number of illusions performed in 5 minutes with the world-renowned Hans Klok – an accolade held to this day. Bello Nock: Bello is America’s favorite comic Daredevil. TIME magazine included Bello in their list of “America’s best artists and entertainers” and he recently wowed the judges on America’s Got Talent. His shows have played to sold-out crowds in Madison Square Garden and his first self-produced theatre show was nominated for a prestigious Drama Desk Award. Bello’s unique blend of endearing comedy and jaw-dropping daredevil stunts make him one of the most exciting live performers in the world today. Young or old, Bello always provides his audience with the gift of laughter and inspiration.